Our Bodhi retreat is the annual gathering of Amida Shu and a rare and precious opportunity to spend time with other sangha members, practising together, listening to Dharma talks and eating and talking together. This year it will take place in our temple in Malvern. Thursday & Friday – services at 8am and 8pm. Morning and afternoon sessions – a mixture of Dharma talks, discussion and practice. Saturday – all day continuous nembutsu with a ceremony in the evening. Sunday – a ceremony in the morning and possibly a session in the afternoon. Cost – £10 a day for food plus dana for Dharmavidya and the temple (a suggested £15 a day or whatever you can afford, whether that’s more or less). Booking is essential so we can prepare to cater etc – email satya@satyarobyn.com with any questions and bookings. We have no accommodation at the temple – I have a list of local B&Bs etc. Yesterday I gave away a paperback copy of ‘Just As You Are: Buddhism for Foolish Beings’. Today I am giving away twenty boxes – or however many you want – through the magic of electricity & the World Wide Web. Amazon US: http://amzn.to/2usMj2V or your own Amazon. If you don’t have a kindle, search for ‘Amazon Kindle app’ for a nifty free app so you can read it on your phone or PC. This book is intended as an introduction to our form of Pureland Buddhism, Amida Shu Buddhism. It’s for anyone who wants to live a good life but is tired of endlessly trying to perfect themselves. If you’re not a foolish being (or if you know any) please feel free to share it. If you find it helpful, that will make me & co-author Kaspalita happy. Also, we always appreciate short reviews as they do make a difference. Enjoy! After the talk we had a wonderful discussion on topics such as the fetters, and if it’s really possible to help someone. You can listen to both below. The five spiritual laws are an interpretation of the five niyamas, passed down to Dharmavidya by Kennett Roshi. In Buddhism compassion is most closely associated with Karuna which is the wish for the well-being of others. Karuna is one of the four divine abidings or four immeasurables, therefore it is outside of normal human calculation and unlimited (divine and immeasurable) . Acting on Karuna, for the sake of others, has lots of benefits. 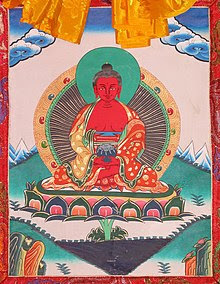 The giver and the recipient both receive something spiritual, as well as whatever material support is offered. There is a reduction of selfishness, or when we find that we are unable to act on karuna, we are shown our selfishness, which is an opportunity for fellow-feeling and tenderness to arise, particularly when we realise that despite our failure we are still in receipt of the Buddha’s wish for our happiness, and nyorai’s blessing. At last month’s Saturday night dharma Satya spoke about giving: the koan of knowing when to give, and how to give skillfully. From our Saturday Night Dharma series. Kaspalita talks about how we stop going around in circles and move to the edge of possibility, using as examples the Buddha’s life, and the stories of Kisagotami and Patacara two disciples of the Buddha who both suffered great losses. Join me in starting a short daily practice? A confession: I haven’t been connecting with the Buddha lately. I’m lucky to live in a space full of rupas and I attend three services a week, but on the days in between I sometimes forget the Buddha for most of the day. I’m re-reading a beautiful book about contemplative ministry which says that the first priority of anyone who ministers (that includes you!) is staying in relationship with the Buddha. If we keep this connection strong, everything else will fall into place. And so today I have committed to re-starting a simple daily practice, morning and evening, which will put something other than my own concerns at the heart of my day. The practice I’ve decided on takes a minimum of five minutes. I’d rather check in for five minutes daily than no minutes. This morning I did it in my office facing my golden Buddha, but it’s simple enough that I will be able to do it anywhere. I know that Amida will love me whether or not I check in with him. But I also know that as a foolish being my life runs more smoothly when I get into good habits, and this is the most important habit of all. If you’d like to join me in committing to a short daily practice of your own, or tell us what you already do every day, click here to do so at our virtual temple (let me know if you get stuck registering or logging on). I’ve said there what I’m going to do in my own daily practice. Do put some time aside to add your comment – it will help others to feel supported if they know they’re not alone. Whatever inspires you, whatever consoles you and keeps you safe, whatever helps you to go out into the world and do good things – here’s wishing you more of it. Namo Amida Bu.